Playing with Planks — The Fit Co.
August= vacation. As many of you take time to be with your loved ones, that doesn't mean you have to stop working out. One of my favorite exercise is the plank as it hits your core as well as upper body. If you don't have much time, planks are the way to go. You could even do it on the beach; the uneven surface of the sand will provide you with an added challenge as you tap into those stabilizing muscles. Try out some of these planks and share your photos with us on Facebook and Twitter! Start in a forearm plank; hold for 30 seconds. Come back to holding a forearm plank. Do 8 reps.
Back to forearm plank- hold for 10 seconds. Add Knee taps - keeping your hips stationary, tap your right knee towards the ground then left. back and forth 8 times on each leg. Come back to your forearm plank; dip your hips to the right then to the left, getting into those obliques, repeat 8 times each. Hold forearm side plank- left forearm. Hold for 20 seconds then pulse hips up for ten seconds. Come through forearm plank then to forearm side plank right - hold for 20 seconds, then pulse your hips up for ten seconds. To hard? Try to plank on your knees. Looking for a little extra challenge? A few more reps will do the trick! If your child is under 3 months, placing him or her on the mat directly under you allows you to kiss and cuddle with them while working your core. 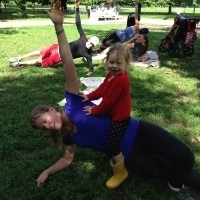 Added challenge, place your child in the Baby Bjorn and still plank! Make them part of the workout! Fun for them and added challenge for you!